This paper questions the validity of using the aggregate demand (AD) and aggregate supply (AS) framework for analysing macroeconomic issues. AD derived from the Keynesian income-expenditure approach cannot be reconciled logically with AS derived from the profit maximization postulate in out-of-equilibrium positions. 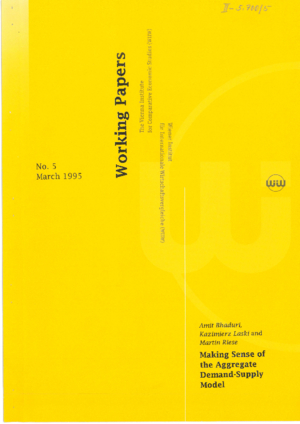 The paper shows two routes to achieving consistency, either by taking recourse to Kalecki's work or by entirely reformulating the analysis along neo-classical lines. Using these two polar cases, it reinterprets the model underlying Keynes' General Theory and modern disequilibrium analysis based on "rationing".